Bundle of creams etc from Clarks. Clarks wax with silicones for smooth and patent leather (shoe). 100ml bottle. Clarks wax with silicones. Suitable for all colours. Woly Unisex-Adult Suede Velours Liquid Colours and Dyes - Light Brown / Sand. Works on all colours. INSTRUCTIONS FOR USE: Bottles have a sponge applicator top for easy application. Shake bottle before use and press sponge onto fabric. Woly Unisex-Adult Suede Velours Liquid Colours and Dyes. Works on all colours. Colour: Dark Brown. Intensifies and deepens the colour. Woly Unisex-Adult Suede Velours Liquid Colours and Dyes. Works on all colours. Colour: Red. Intensifies and deepens the colour. 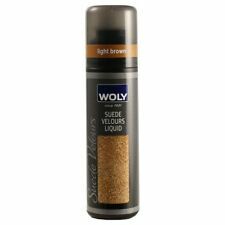 Woly Unisex-Adult Suede Velours Liquid Colours and Dyes. Works on all colours. Colour: Neutral. Material Composition: active fluorine ingredient silicone oil dyes water. 10 Piece Shoe Kit. A Punch shoe horn. Punch Shoe Stretcher 50m/. Punch shoe cream. White 50ml. Comprised of:-. Black 50ml. 10 Piece Shoe Kit SALE. A Punch shoe horn. GRISON shoe cream de luxe. All the above Made in. Leather Gel 100ml. White 50ml. Black 50ml. Resists rain and stains. Woly Unisex-Adult Suede Velours Liquid Colours and Dyes. Works on all colours. Material Composition: active fluorine ingredient silicone oil dyes water. Woly Unisex-Adult Suede Velours Liquid Colours and Dyes. Works on all colours. Material Composition: active fluorine ingredient silicone oil dyes water. Intensifies and deepens the colour. Woly Unisex-Adult Suede Velours Liquid Colours and Dyes. Works on all colours. Colour: MAHOGANY. Intensifies and deepens the colour.